Tropical cyclones—also sometimes referred to as hurricanes and typhoons—are taking substantially longer to move from place to place, according to a new study by NCEI scientist Jim Kossin. In his paper, “A Global Slowdown of Tropical Cyclone Translation Speed,” published in Nature, Kossin demonstrates that, globally, tropical cyclones slowed by 10 percent between 1949 and 2016. With additional water vapor in the atmosphere in a warming world, as little as a 10 percent slowdown could double local rainfall and flooding impacts caused by 1°C of warming. According to the study, tropical cyclones have slowed in both hemispheres and in every ocean basin except the Northern Indian Ocean. But, tropical cyclones have generally slowed more in the Northern Hemisphere, where more of these storms typically occur each year. Regionally, the western North Pacific Ocean has seen the most slowing at 20 percent, followed by the region around Australia at 15 percent. Was Hurricane Harvey just the beginning? Hurricane Harvey in 2017 serves as a dramatic example of the consequences a slow-moving or “stalled” tropical cyclone can produce. Harvey—the hurricane that refused to leave—dumped upwards of 50 inches of rain on Houston, Texas, and the surrounding area in just five days. Some locations received two feet of rain in just two days. Harvey’s torrential rain raised river and creek levels to record highs across the region, and devastating flooding ensued. Thousands of people had to be rescued from their homes, and 89 lives were lost during the storm. The flooding displaced 30,000 people and damaged or destroyed over 200,000 homes and businesses. More than $126 billion in economic losses are directly attributed to Hurricane Harvey. While slower movement of tropical cyclones can most certainly lead to higher rainfall totals and devastating flooding, it was not the only factor that led to Harvey’s devastation. In addition to moving slowly, Harvey also reversed direction causing it to impact the same region for a particularly long period of time. 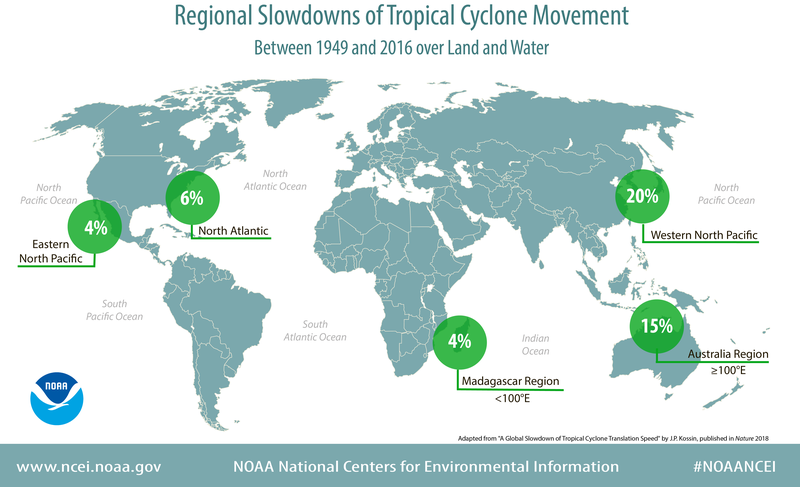 What is causing tropical cyclones to slow down? As can be seen with Hurricanes Harvey, Maria, and Irma in 2017, a complex interaction of environmental factors controls how intense a tropical cyclone becomes. However, steering winds are typically the main forces that control how fast a tropical cyclone moves and drive it to where it’s going. In a warming world, atmospheric circulations are expected to change. And, the atmospheric circulation that drives tropical cyclone movement, in particular, is expected to weaken. “The observed 10% global slowdown occurred in a period when the planet warmed by 0.5°C, but this does not provide a true measure of climate sensitivity, and more study is needed to determine how much more slowing will occur with continued warming. Still, it’s entirely plausible that local rainfall increases could actually be dominated by this slowdown rather than the expected rain-rate increases due to global warming,” Kossin remarks. One thing scientists do know is that the location where tropical cyclones reach maximum intensity has been shifting toward the poles. And, this may be related to or even causing the overall slowdown. Continued research into how our changing climate is impacting tropical cyclones is essential to understanding and predicting changes in risk that are occurring across the globe.